Space, the final frontier. It’s always a battle to find enough space in the workshop. If I’ve learned anything over the years it is that if you have the space, you will fill it, and there will never be enough room. Consequently, I’ve become very good at squeezing more things into less space. The downside is that sometimes you forget where things are, or that they exist at all. This runs in direct opposition to my Kaizen training—where visual systems rule the roost. I find it neccessary to routinely jockey tables, benches and machinery around in order to accomodate projects as needed. Good things in small packages: the original 6L headstock pattern. As I was rearranging things yesterday I came upon a small box marked “Jol’s work patterns.” Inside was a time-capsule of paper cutouts shaped like guitars folded up neatly. In an instant I knew what I’d found. Before the advent of CAD, I did all my design work in full scale on a drafting table. When specifying a custom order for construction in the shop I would draw it and then cut the pattern out to be used as a template in the woodshop. 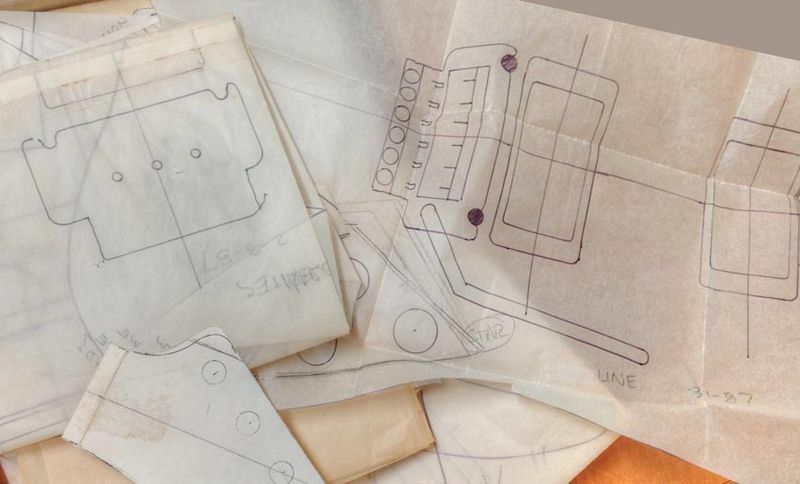 These paper patterns contained all the location and configuration information we needed—it was the blueprint that we used to create a customer’s guitar. I have many large boxes full of my original Hamer drawings, blueprints and templates, but this small cache was part of a stash that somehow got separated from the rest. It was a bit like time travel to look through it and I intend to share more of it as time goes on.